It's pretty unusual for Kien and I to spend all day at home on any Tuesday. But last Tuesday's tumultuous weather was not conducive to venturing anywhere. I was all geared up to do some baking with Kien, but alas, when I asked him if he wanted to bake muffins with me his prompt response was "no!" followed by "I want helicopters on iPad". So he entertained himself and I baked on my own. I love warm home made muffins for morning tea on a dreary winters day. The sun came out in the late afternoon, and I bundled him up warmly and went outside. I love seeing raindrops dripping off Agapanthus. It was nice to be out and about even though we only stayed within a 100 meter radius of home. 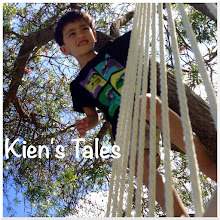 Kien liked playing in the "stream". The stillness after the rain is so beautiful. Gorgeous photos! Sometimes the easy option is to stay inside when the cold weather hits, but you've just proved that getting outside is good for the soul!